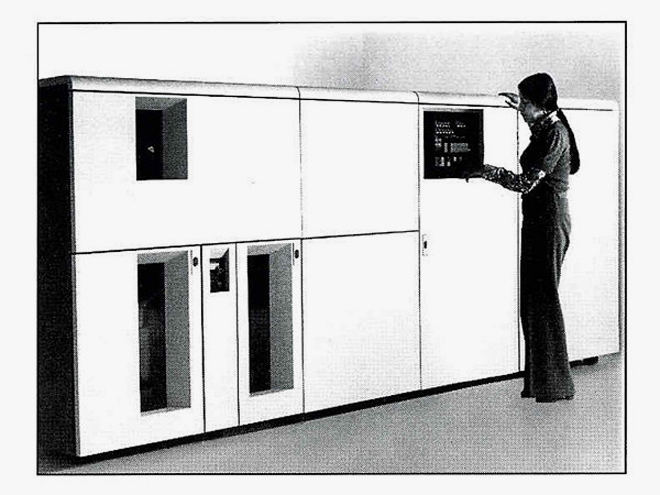 Announced forty years ago this month, the IBM 3800 was the world's first commercially available laser printer. In one form or another the 3800 was in production for a decade-and-a-half and revolutionised high-volume computerised printing. Beating rivals Xerox to market by a year, the IBM 3800 was a massive device that could typically print about 167 pages per minute. Today, even a high-end device such as the Ricoh Pro 1357 would struggle to keep up. Crucially though, the IBM 3800 used continuous stationery rather than cut-sheet paper which must have helped with the throughput. The print resolution was about 160 dpi. It wasn't cheap - even the 1987 model cost a staggering $175,000, but then you would hook it up to an IBM mainframe which would have cost you a couple of million dollars. Strictly an enterprise computing component, the 3800 must have been a welcome relief from the deafening noise of banks of impact printers. It wasn't until the mid 1980s that laser printing because remotely affordable on the desktop, with the breakthrough product being the original HP LaserJet. IBM span off the printing business as Lexmark in 1991, which still exists today. Today you can pick up a new small laser printer for less than €50, with typical very high volume systems coming in at €35,000 or more.